You can drive a 2009 Chevrolet Camaro for one year compliments of Berger Chevrolet in Michigan! It looks like GM finally has the message about pricing new products. With recent releases like the Chevrolet HHR starting at well under $20,000, has GM got the message? Ed Welburn is quoted in this article in the New York Times about the Holden Efijy. With recent reports the base level 3.9l V6 Camaro starting at $21,000, that is good news for future Camaro owners everywhere. Though its recently introduced Chevrolet HHR has been a modest hit, G.M. remains a little gun-shy of retro designs. That’s after its experience with the slow-selling Chevy SSR pickup, a 2000 concept. But somewhere between the popular concept and production, the SSR’s charisma was compromised. The vehicle’s original shape was retained for the most part, but its size grew and so did its price. In another great PR move by GM, the Silver Camaro Concept Coupe is in South Florida along with the press from almost every country in the world. The Superbowl is coming February 4th and the Camaro is taking at least a sliver of the attention. GM is offering another round of test drives for the press. In the article below, Josh Dowling from The Sydney Morning Hearld takes the Camaro for a spin on the Miami Speedway. I found an interesting article tonight. It mentions a few little things, including the mule Camaro chassis that are running around Australia under Commodore bodies, maybe due in showrooms in later 2008, earlier then the first quarter 2009 comment we have heard more than once. Looking at this Camaro, you might not immediately recognize that it is anything special. After all, there are countless Z/28, RS and SS versions scattered in every corner of Westworld this week. And as far as powerplants go, this has but a 275hp 327 V8. No slouch certainly, but with ZL-1, COPO, 302 and 396 options aplenty, the 327 doesn't really stand out that much. It even has an automatic. So what makes this one noteworthy? First of all, note that it's a 1967 model. That was the first year for Chevy's answer to the Mustang. And then take a look at the VIN. It's number 16. It's also Fisher body #001. It goes without saying that it also happens to be the first L.A. built car with the deluxe interior. These are the kind of things that the specialists pay attention to. The seller is billing it as the lowest surviving VIN. We're not sure if that means all 15 cars that preceded it are gone, or that they were all prototypes, but it is certainly one of the earliest Camaros ever made, and quite a sharp looking car to boot. Classic Ermine White exterior with Red Deluxe interior that looks factory fresh. It appears the General has learned a thing or two about pricing it's new models. With the sea of Chevrolet SSR pickups and Pontiac GTOs that sat on dealer lots for months, it looks like the plan to price the new Camaro in line with the Ford Mustang is becoming a reality. GM needs to do this if they have any hope of the program succeeding. some important details regarding the replacement of GM's lineup of larger than midsize sedans, the Pontiac Grand Prix and the Chevrolet Impala. Lutz confirmed that the Pontiac's successor would be called the G8, following in suit with the G-number naming scheme, and that the car would have "distinctive Pontiac styling". The G8 will be a rear-wheel drive vehicle, launching the Zeta platform in North America. However, Pontiac will initially be following a proven formula used with its recent GTO, with production first beginning in Australia alongside its brother, the Holden Commodore, with which it shares its underpinnings. The sources also were able to confirm a couple of other important details that Camaro fans will most certainly enjoy. The base V6 model is said to have an MSRP starting at around $21,000 US dollars, and would have GM's 3.9-litre V6 engine with a choice of six-speed automatic or manual gearboxes. Also, regarding the Camaro's styling, the magazine reports that the body will remain close to the concept in terms of its design and dimensions. The only changes reported are an increase in roof height by 15.9 mm (5/8ths of an inch), while the body has been slimmed down by 8.5 mm (1/3rd of an inch). Can GM keep the public's interest in this car for two more years? DETROIT - While sales of the Camaro are at least two years away, Chevrolet kicks off a two-year campaign this spring to generate buzz for the car. The campaign includes a primary role for the Camaro in an upcoming movie, tie-ins with Major League Baseball, music videos, fashion shows and movie stars, a Web site that will include the words Camaro Nation, and a long list of other activities. Said General Manager Ed Peper: "We are going to have loads of things going on. My ultimate goal would be to get at least three months' or more worth of orders before we get to build the first one." Orders will be accepted once prices are announced, sometime near the production of the first model. Other tie-ins are planned with the Grammy Awards, Country Music Awards and the New Year's Eve celebration Chevrolet sponsors on network TV. "There is an enormous amount of things that we will try to do in the next two years to keep the buzz going," said Peper. The Camaro coupe goes on sale in early 2009, followed several months later by the convertible. A hardcover book that chronicles the car's development will be released when the Camaro goes on sale. Peper said the new Camaro has a featured role in the science-fiction thriller Transformers, which opens July 4. Steven Spielberg is the film's executive producer. "That will be a huge deal for us," Peper said. "We are going to get a lot of play off that this summer into the early fall." Last week's unveiling of the Chevrolet Camaro convertible concept won oohs and aahs that rivaled those for the Camaro coupe concept shown at last year's auto show. But at least a few analysts and prospective buyers question whether General Motors Corp. can keep the excitement going until the sports car reaches showrooms in 2009. "The positive buzz in 2009 certainly won't be as intense as when the coupe first rolled out last year," said auto analyst Kevin Tynan of Argus Research in New York. "You even saw it last week. The convertible generated some excitement, but it didn't generate as much buzz as the coupe did last year. ... The response was: 'OK. Just build it already.' "
But GM says it's bringing the car to market on a time line that compares with the time it took to bring the Pontiac Solstice to market from its unveiling as a concept car. "We've got all kinds of things planned to keep the buzz going," said Chevrolet General Manager Ed Peper. "One of them is, it will be the star of the 'Transformers' movie this summer." Auto analyst Erich Merkle said he believes the Camaro will still be hot in two years. GM's only mistake with the Camaro was killing it in the first place, he said. "I don't think they'll have any problem generating excitement. God, I love that car." Jimmi Jammer door security for the 2007 GM trucks! The Jimmi Jammer™ door security plates are now available for the 2007 GMT900 Silverado, Sierra, Avalanche, Tahoe, Yukon, Suburban, Escalade and EXT. We're aware of only one way in which the Chevrolet Camaro Convertible concept is like Christmas: The knowledge that it's coming and will be shown at the 2007 Detroit Auto Show does little to diminish the excitement when it arrives. We find this also true of Oktoberfest, but that is another story. The existence of the Camaro Convertible concept was so predictable, in fact, that any number of Photoshop manipulators, both amateur and professional, have already built their own. Or at least they have made virtual versions of it for fun or profit. In the last 12 months an entire cottage industry has cropped up around digitally chopping the top off last year's Camaro Coupe concept. Well, those Photoshop junkies are about to be put out of business. Here's your first real look at the production version of the Camaro convertible, which will go on sale around the middle of 2009, several months after the coupe's launch. Looks good from where we sit, but too bad about those Z28 stripes. We don't want to understate what the folks at GM design have done here, but the convertible concept is, in effect, a coupe with its top chopped off. And we mean the company literally chopped the top off. The team, headed by Exterior Designer Tom Peters, popped a fresh fiberglass Camaro-coupe-concept body out of the mold used for last year's showcar and got to cutting. It is a testament to the tedious and time-consuming detail work of the design team that the car doesn't really look much different from the coupe. Although the doors and front end are unchanged from the coupe, the upper half of the car's rear section is entirely different. According to Peters, if you measured down 2 inches from the top of the rear fenders, everything above that line is new. Consider the rear spoiler, for example. The one on the convertible looks the same as the little lip on the trailing edge of the coupe, but it's not. It's shorter and is set at a different angle to the rear deck. This and thousands of other minute contouring changes are aimed, paradoxically, at making the convertible look like the coupe — making it appear as if you could construct your own version given only a Camaro coupe and a reciprocating saw. To endure a description of each example of surface-change minutia, one would have to be paid a great deal of money by General Motors. It is perhaps more fruitful, or at least less painful, to discuss the more obvious changes to the vehicle. Possibly, you've noticed that the convertible concept's body is covered in retina-searing orange paint. This is more officially referred to as Hugger Orange pearl tri-coat. The paint treatment, both the Hugger Orange and the dual gray stripes, nicely represent the thinking behind the convertible concept. The thick double stripes on the hood and deck lid, which were used on the Z28 model beginning in 1967, are obviously another retro touch. Instead of white or black stripes that were most common 40 years ago, Chevy went with decidedly modern gunmetal gray stripes for the new concept. It's just that kind of interplay between retro inspiration and modern finish that made the Camaro coupe such a success. The problem is, Chevy never built a first-generation Z28 convertible, so we question the choice. "We wanted the convertible to have a more fun, sporty personality to it," said Peters. "The coupe had machined seriousness to it which was partly inspired by the T2 [Terminator 2] robot." Certainly the new wheels were designed to strike the same balance. Intended as a modern interpretation of the classic Chevy Rally wheels, they're the same size as those on the coupe (21 inches front, 22 inches rear) and have become a focal point. The way the radial lines of the spokes are carried to the very edge of the rim makes the wheels look enormous. And the combination of a highly polished rim, gray-painted spokes and raw aluminum centers keeps your eyes' attention for longer than the relatively austere, machined five-spokes of the coupe. There's also more retro in the wheels' orange pinstripe that mimics the look of old red-line tires. To temper the coupe's malicious mien, the designers added a few more shiny bits to the body. The convertible's taillamp surrounds are now highly polished as is part of the exposed racecar-style fuel filler. The windshield, which is about 10 millimeters shorter than that of the coupe, is also covered in bright anodized metal. Lead Interior Designer Micah Jones gave the convertible's cockpit a fairly large dose of Prozac compared to the unremitting — almost German-level — somberness of the coupe's cabin. Only a designer could claim that white is both retro and modern. Technically white isn't even a color. But we see where Jones is going here: White is the color of that ubiquitous totem of modern design, the iPod and the stark contrast of white and black interior pieces and upholstery is reminiscent of the old black-and-white houndstooth upholstery offered four decades ago, certainly in combination with Hugger Orange. The interior's basic design is unchanged from the coupe, with the same uncluttered dash and cool four rectangular auxiliary gauges just forward of the shifter. But now the deep-dish, retro-unreadable gauge faces are white instead of aluminum and are trimmed with blue light. And to make room for the top mechanism, the rear bucket seats are squeezed nearer each other. Actually, that's not true: There is, in fact, no top mechanism because there is, in fact, no top. It's a concept, OK? There's nothing under that black hard tonneau cover. There's a reason we haven't mentioned the powertrain, suspension, brakes or any other dirty bits yet in this story: They are unchanged from the coupe. Even Chevy's public relations people don't mention how much horsepower the 6.0-liter small-block V8 makes or the number of gears in the manual transmission. When pressed, they'll say it's "carryover" from the coupe, meaning 400 hp, six speeds and rear-wheel drive. The suspension is all-independent just as it will be when the production version, based on an Australian-designed Holden platform, arrives in about two years. Likewise, the top engine will be the big pushrod V8, while base cars will receive V6 power. Like we said, nothing too surprising but we're still excited to see and drive the real thing. The two most obvious, of course, were the Camaro coupe - star of last year's Detroit Show - and its bright orange convertible sibling, a car that will undoubtedly be one of this year's crowd pleasers in Cobo Hall. Both cars roll on GM's Zeta rear drive architecture, which was developed in Australia by GM's Holden subsidiary. Zeta came into being to support Holden's home-grown Commodore family of vehicles, which form the mainstay of GM sales in Australia. Aussies like roomy, rear drive sedans, and when Detroit went front drive in the 70s, the Holden engineers had no choice but to continue to do their own thing. And it's just as well they did, because without Holden, there's no way GM would be looking at producing a Camaro - and a rear drive Chevy Impala - by the end of the decade. Zeta is a very versatile architecture. The front axle centerline on the Camaro is about 50mm further forward than it is on the Holden Commodore (and therefore the Pontiac G8, the lightly made-over Commodore sedan that will debut at the Chicago Show next month). The reason for this expensive change is that it allows the Camaro - and the Impala - to run 20-inch wheels without compromising steering lock. In fact, says one Holden source, 24s will fit. Both the Camaro coupe and convertible concepts are therefore very close to the production versions, say GM insiders. The roof of the coupe will be raised about 15mm for production, and the bodysides will be pulled in 5-10mm. But that's about it. What you see here at Detroit is basically what you're going to get in Chevy showrooms in 2009. Camaro wins 'best of show' again! Billed as the new American muscle car, the Chevy Camaro Convertible is already winning over the public as a panel of 100 Detroit News readers dubbed the concept vehicle "Best of Show." The Camaro headlined the 2007 Detroit News Readers' Choice Award winners which Detroit News Editor and Publisher David J. Butler announced today at the Detroit Economic Club's North American International Auto Show 2007 Luncheon. Selected from more than 2,000 volunteers, the 100 readers toured the show Wednesday and choose winners in categories such as "Sexiest Vehicle," "Most Earth-friendly" and "Best Family Hauler." "Manufacturers really respect these awards because they are the only awards given at the North American International Auto Show that comes from the car buyer," not from journalists and industry insiders, said Nolan Finley, News editorial page editor, who hosted the reader-judges. How to create a curtain-raising splash for the Detroit Show? GM’s answer was to hire celebrities – including genuine Hollywood A-listers Christian Slater and Vivica Fox , as well as US comedians, soap stars and reality TV show winners from further down the celeb food chain. The celebs paraded down a long catwalk, each accompanied by a GM concept car from around the world – many of which have already been seen at global motor shows. But the undoubted star was the new Chevrolet Camaro, a retro revival of the 1960s muscle-car favourite seen as a concept car hard-top at last year’s Detroit Show – but now confirmed for production in 2009 in both body styles. The Camaro was the only model – human or automotive – to win a standing ovation from the crowd. In bright, ‘70s-style orange with dark grey competition stripes, the Camaro should make for an interesting contest with Ford’s equally iconic Mustang – and should prove whether or not America’s ongoing romance with retro muscle cars is a long-term trend. Ed Welburn, GM vice president, global design, has no doubt: "The best follow-up to last year's award-winning Camaro concept is a Camaro convertible," he said. It’ll be powered by a V8 engine, and manual transmission will be standard. It isn't much - I am sure we will see much more of this car in the coming weeks. DETROIT – The Chevrolet Camaro concept was the celebrated star of the 2006 auto show season. You can only top that by literally and figuratively blowing the top off. That’s exactly what GM’s designers and engineers did to create the Camaro convertible concept. The introduction of the Camaro convertible concept was on the eve of the North American International Auto Show at GM Style, an exclusive, fashion-splashed event combining celebrities, couture and automobiles. 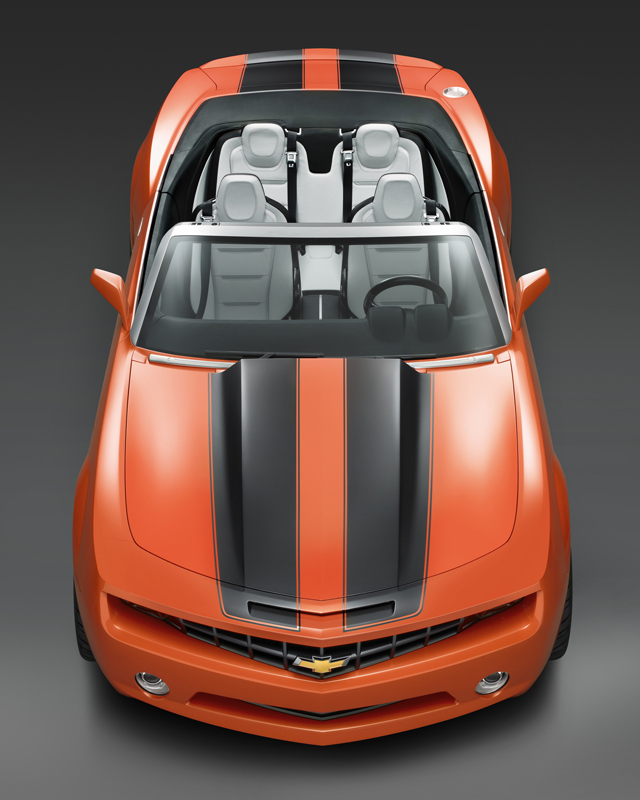 The Camaro convertible concept, wrapped in Hugger Orange pearl tri-coat paint with twin gunmetal gray sport stripes, is based on the original Camaro concept, with only minor changes required to accommodate the convertible body style. The Camaro convertible concept embodies strong heritage while appealing to a new generation of customers who seek a distinctive statement in a new car. Chevrolet already has announced production plans for the Camaro, which will go on sale in 2009. A production convertible model will be added later that year. Like the Camaro concept vehicle, the Camaro convertible concept blends a dramatic, forward-looking design that is mindful of the brand’s storied heritage. That design includes classic long hood/short deck proportions and a wide, wheels-at-the-corners stance that gives the vehicle the look of hugging corners even when stationary. The Camaro convertible concept is motivated by a torquey V-8 engine that rightly sends power to the rear wheels via a manual transmission. It also features a four-wheel independent suspension system and four-wheel disc brakes. The Camaro convertible concept shares exterior dimensions with the Camaro concept, although the convertible concept’s windshield surround, which features a bright anodized finish, is changed slightly to accommodate the convertible top. The Camaro convertible concept’s Hugger Orange pearl tri-coat color is a contemporary update of the classic hue, which was originally offered in 1969. It is complemented with twin gunmetal gray sport stripes. The modern interpretation of the classic color and its dark accent stripes simultaneously reflect the Camaro’s heritage and deliver a deep, lustrous and thoroughly contemporary appearance. The Camaro convertible concept rides on 21-inch front wheels and 22-inch rear wheels. The wheels have a deep-dish, five-spoke design and feature charcoal center sections with bright outer edges and a red outline on the wheel edge. The charcoal wheels complement the gunmetal gray stripes on the body. Inside, the Camaro convertible features a simple yet purposeful interior that reflects design elements inspired by the muscle car era, including the first-generation Camaro. A new, light-and-dark color scheme enhances the airy feel of the convertible, particularly when the top is lowered. The seats’ fronts feature platinum-tone leather surrounding suede-like Alcantara® inserts, with black, sculpted seatbacks. The use of light color only on the seating surface is reminiscent of vintage houndstooth interiors, while a matching, tri-coat platinum paint is used to accent the door panels and instrument panel, giving a modern, bold feel to the interior. “The light-on-dark interior coloring makes a strong statement that conveys the spirit of freedom and fun that is embodied by a Camaro convertible,” said Micah Jones, interior designer. As with the Camaro coupe concept, the convertible concept features an instrument panel inspired by first-generation Camaros, including an intricate “round-gauges-in-square-holes” design. The gauges have a deep, three-dimensional appearance, with white faces and red pointers. “The instrument panel – including the four auxiliary gauges mounted in front of the shifter – pays homage to first-generation Camaros, while achieving a modern appearance through its refined integration of components,” said Jones. Craftsmanship and attention to detail are evidenced throughout the interior, including the smoke satin aluminum finish on trim plates, vents, seat handles and safety belt buckles. The shifter and pedals are made of billet aluminum. The steering wheel has a detailed, deep-dish three-spoke design and the front seats are hinged at the center – rather than the sides – for an integrated appearance. A separate ignition button is used to start the engine and the speedometer and tachometer needles complete full-sweep indexing when the engine rumbles to life. A “spine” motif runs through the center of the vehicle and on the seatbacks, including a prominent center console that stretches to the rear seat. The spine reinforces the symmetry of the Camaro convertible, as well as its precision. 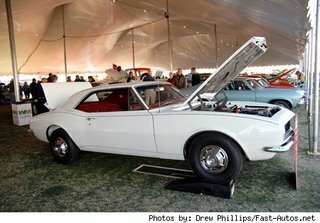 The original Camaro was introduced to the Baby Boomer generation, a large group of young, individualistic and mobile Americans that drove fundamental changes in the auto industry. The Camaro was personal, sporty and powerful – attributes that were typically found on more expensive, smaller and, often, foreign sports cars. The Camaro represented a real life-sized sporty car that was attainable for just about everyone. An almost endless list of optional features, colors and trim combinations ensured owners could tailor their Camaro to their exact taste. As Boomers transitioned into larger vehicles to accommodate growing families, younger drivers embraced used Camaros as their first cars, and third- and fourth-generations of the Camaro continued to deliver affordable fun and performance to a new generation of enthusiasts. Indeed, hundreds of thousands of owners of all walks of life have found driving fun in a Camaro during the past 40 years. The new Camaro concepts draw on their namesakes’ heritage, but also the global, youthful influences of the 21 st century. These influences are seen in the Camaro convertible concept’s bold proportions, tailored wheel-to-body relationship and detailed interior – including the multi-dimensional instruments. It’s a design that resonates with a generation of younger car buyers influenced by highly stylized “tuner” cars and import sports cars. A year ago, Chevrolet unveiled the Camaro Coupe Concept to rave reviews at the North American International Auto Show in Detroit. It was the hit of the show, and it led to the announcement that Chevrolet will again produce the Camaro Coupe, starting in 2009. The goal this year was to top last year’s announcement – and we have, by blowing the top off!!! 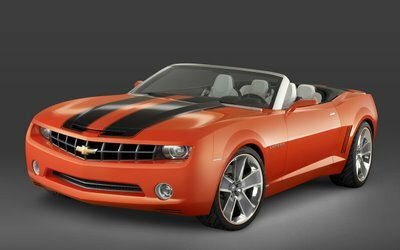 On Saturday, January 6, 2007, at the GM Style Event in Detroit, the Camaro Convertible Concept will be unveiled for the first time. In the same manner that the original Camaro concept raised the pulse of enthusiasts everywhere, I believe the new Camaro Convertible Concept will continue to represent for Chevrolet the direction of its vehicle line up – expressive style, spirited performance and great value. 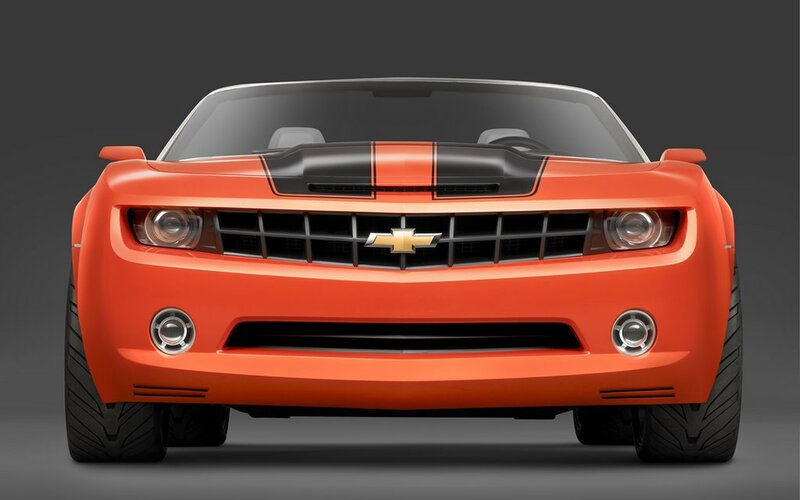 From its updated Hugger Orange pearl tri-coat paint with twin gunmetal gray sport stripes to its four auxiliary gauges located near the shifter, the Camaro Convertible Concept celebrates many of Camaro’s heritage features in a contemporary way. Although this is a show car and not the actual production vehicle, it was designed to represent the production model that will follow within a year of the Camaro Coupe production. For further information regarding the Camaro Convertible Concept, the press release has been attached to the end of this message. Shortly, you will receive a copy of the hero card poster that is being distributed to the public at the North American International Auto Show. In the meantime, you and your customers can gain further details and pictures by visiting “chevy.com/performance”. This website will be available for viewing starting on Sunday, January 7, 2007. The Camaro has touched many lives with nearly 4.8 million being produced over 30 years. The love and lore of Camaro remains strong. The Camaro concepts redefine the Camaro for both existing and new generations of fans in a contemporary way with responsive performance and modern technology. We look forward to its rebirth in 2009! We have heard the recently introduced Camaro Convertible concept car was built near Detroit, Michigan, not in Canada as you will read in the article below. The Chevrolet Camaro convertible concept will be unveiled at the GM Style event on the eve of the North American International Auto Show in Detroit, Michigan, Friday. DETROIT (AP) - General Motors Corp. said Friday it plans to offer a new Chevrolet Camaro convertible in 2009 and will display a concept version of the Canadian-made convertible at a gala event surrounding the North American International Auto Show. GM said last summer it would make the new Camaro at its plant in Oshawa, Ont., just east of Toronto. The new Camaros are expected to land in dealer showrooms by 2009. The convertible concept, which will be unveiled Saturday at a media event, is based on the original Camaro concept that received rave reviews at last year's auto show in Detroit. GM stopped making an earlier version of the Camaro in 2002 but decided to bring back the iconic muscle car to appeal to car enthusiasts and younger buyers. The new version will offer better fuel efficiency and more sophistication than the 1969 version on which it's loosely based. "The Camaro convertible concept instantly evokes an emotional response - it's a vehicle that you want to make room for in your garage," said Ed Welburn, GM's vice-president for global design. The rear-wheel-drive convertible concept features a V8 engine and manual transmission. It also has a four-wheel independent suspension system and four-wheel disc brakes, the automaker said. Well, whaddya know? After last year's Camaro Coupe concept, along comes the convertible. It didn’t take a rocket scientist, or the brain power of that guy who kept winning Jeopardy, to deduce that GM would follow-up its much-praised Chevy Camaro Coupe concept with a ragtop version. The production Camaro is still more than a year away, so to keep interest in the company’s pony car strong, this drop-top concept will take center stage on GM’s Texas-sized display at the Detroit auto show. To our eyes, chopping the top makes the Camaro look even more smokin’ than before. While the coupe was cool, this has cruisin’ down Pacific Coast Highway written all over it. You can bet GM CEO Rick Wagoner already has the keys for next summer’s Woodward Dream Cruise. The conversion from coupe to convertible may look like a simple chop-job, it involved modifying most of the bodywork aft of the doors so as to make space for a folding roof. The windshield was also re-jigged—it’s higher in the middle and lower at the corners—and features a shiny billet-aluminum frame. Designer Brian Smith says he envisages a simple cloth top with a glass rear window and small quarter side-glasses. But, for the concept, there’s no actual top beneath that leather-covered, rear-hinged hard tonneau, so bring your rain poncho. To tie-in with the original ’69 Camaro convertible, the concept gets a paint job in eye-poppin’ Hugger Orange pearl tri-coat with twin gunmetal-gray stripes. Check out the thin, orange pin-striping around the rims of the wheels to echo the look of the old Redline tires. Inside, there’s a new black and white color scheme. The seats are trimmed in Saturday Night Fever-style white leather with white Alcantara faux-suede inserts, while the instruments get new white faces with cool blue neon rings. Interior designer Micah Jones had to rework the rear seats to make room for the top folding mechanism, which meant ditching the rear section of the center console from last year’s coupe concept. Apart from those show-car 20-inch front and 21-inch rear wheels and some embellished trim and interior bits, what you see here is pretty much what you’ll get when the Camaro convertible hits showrooms in 2010, a year after the coupe. Those who’ve seen the production versions in the hallowed halls of GM Design say both coupe and convertible stay amazingly true to the concepts. Under the skin, the new Camaro will ride on a version of GM’s Global Rear Drive platform—known internally as Zeta—developed by GM’s Aussie Holden division. It features a four-link independent rear end which should give the Camaro a handling edge over the live-axle Mustang. Expect V-6 and V-8 power and a starting price around $25k. We’re drooling already. 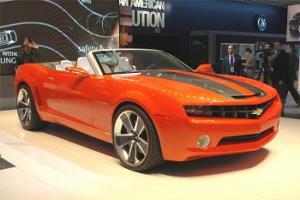 If showing a Camaro convertible concept at the 2007 Detroit show seems obvious, that's only from your armchair. It may not be so obvious as it is necessary. Chevy will launch the Camaro coupe in late 2008 as a 2009 model; then to battle the other Ford Mustang body style, it'll launch the Camaro convertible about spring of 2009. As the concept makes the rounds of car shows following its Detroit debut, GM Australia ishard at work on the production car. Expect thicker sills and tunnels and added cross-bracing to give the convertible's unibody coupelike stiffness. The convertible concept has charcoal SS stripes over a lustrous Hugger orange paint job-the stripes are so dark they appear black under certain light. You might think of the 1969 Camaro RS/SS Indy 500 official pace car, which has orange stripes on a white body. The two back seats are about six inches closer together to make room for the tonneau cover. As in last year's coupe, the front seat tracks are on the center console and on the rocker panels instead of the floor for better rear-seat foot space. Circular gauges in square frames seem certain for production. The large, round gauges now are white-faced, with black chrome numbers and a red anodized needle, for more clarity, versus the coupe's turned-aluminum face with chrome numbers. There's a blue glow circling the convertible's gauges, and the only reference inside to the orange paint is the seat stitching. The deep-dish three-spoke steering wheel and Rallye Pack-inspired four-pack gauge cluster at the base of the floor console, fortunately, return. The six-speed manual's gearshift looks like a piece of sculpture, and the chromeseatbelt buckles are designed to look like the iconic belt buckles in late 1960s GM cars. The convertible concept has last year's ram-air 6.0-liter LS2 engine, rated 400 horsepower and with Active Displacement Management and an exhaust note that makes a sensuous, throaty burble. Built on the next-generation Holden/ Zeta architecture, the car has independent rear suspension. It's likely the base engine will be the DOHC 3.6-liter V-6, not the 3.9-liter pushrod V-6. The best news is, size the tires down to a "normal" 18 or 19 inches, and you're looking at the convertible you're likely to find in dealerships in 2009. Stay tuned for our full story on the Camaro Convertible concept coming soon to MotorTrend.com and the upcoming March issue of Motor Trend. Right before the NAIAS in Detroit, Michigan - the pics of the long awaited Camaro Convertible surfaced on the internet this afternoon. Stay tuned to this blog for many more pictures to be uploaded. 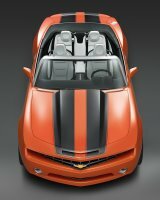 Speculation has been that GM will have a convertible Camaro concept on display during the 2007 NAIAS. 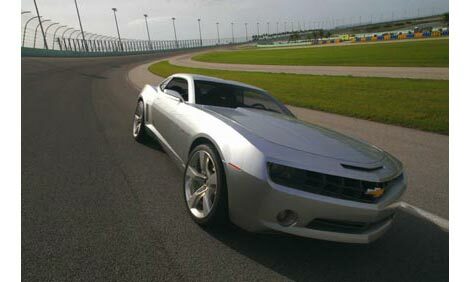 It is rumored this car was in the works during the August 2006 official introduction of Chevrolet's intent to produce the Camaro as a 2009 model. The car is this much closer to reality. 5thgen.org to debut Camaro Convertible! If you are looking for pictures of the 5th Generation Camaro Convertible, you should check out 5thgen.org this coming Saturday night (January 6th). They will be at the GM Style show preceeding the opening of the 2007 NAIAS in Detroit, Michigan. Visit the forums for the latest news and some great renderings of the new Camaro!